i have to say, i was super eager to give LT his first taste of solid food at 6 months. as soon as the 6 month mark approached, i pulled out the food processor and practiced pureeing. i know you might think it's a bit early. rest assured after speaking with 2 pediatricians and reading of medical journal articles, i decided it was the right choice for us. 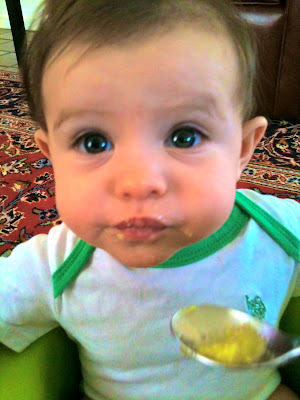 of course, this is a slow introduction to solids. breast milk will continue to be his main staple with solids as a light supplement. it was decided, squash was going to be the first to tantalize his taste buds. very simple, really. rinse, cut, steam...voila, baby food! okay, well there were a couple more steps. but, it's so easy, i swear! of course, i started with farm fresh organic squash. after rinsing, slice squash on the bias. then, quarter each half. don't dice or cut too small, otherwise you'll end up with water logged squash. the goal is to soften the squash, without overcooking...about 15 minutes. once squash have softened, place them in a food processor along with 2 tbsp reserved steam water and 1 tsp olive oil. blend together until smooth. add more steam water is needed to thin the squash. me and LT were super excited for his first bite! watching LO push food around his mouth was super duper funny. at first, he was trying to figure out what the heck that grainy stuff was. after a few bites, he got the hang out it and wanted more! i started out with 2 tablespoons for the first few days. he's now eating a 1/4 cup of squash twice a day around noon and 4pm. tip: freeze the leftovers in ice cube trays and store in the freezer. defrost in the fridge or place in a ziploc and set in warm water.